Welcome to my blog. Feel free to visit any time to see what I have been up to. On a Friday afternoon back in February I was driving home from a shoot in Newcastle and wondering what to do with the weekend. 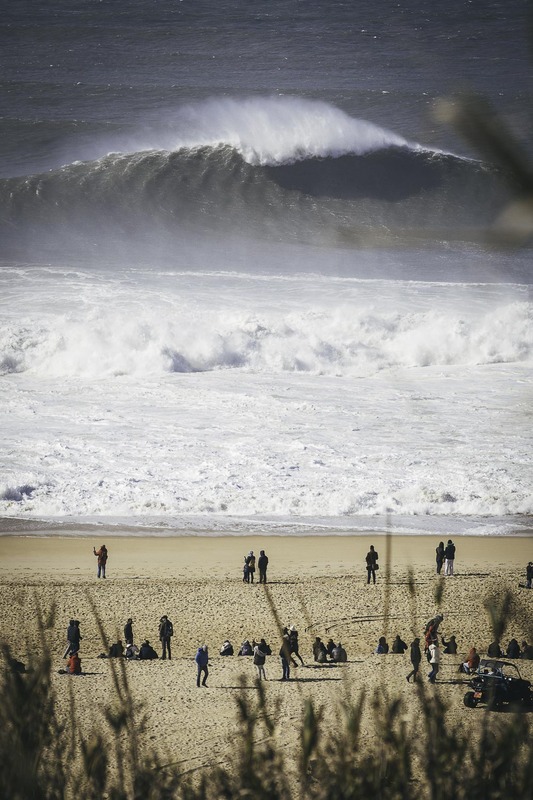 A couple of days earlier I had read that there was huge waves headed for Portugal and that the Nazare Challenge might be given the green light. 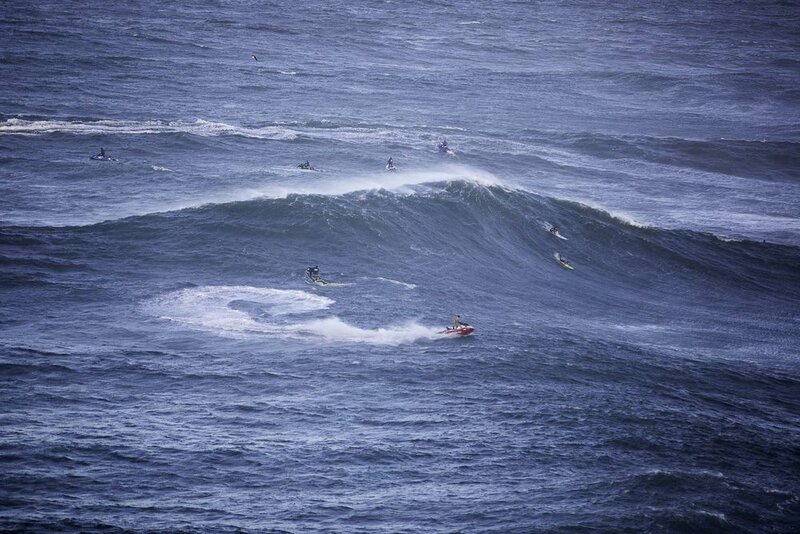 The Nazare Challenge is a big surf event with a 3 month window through the winter. 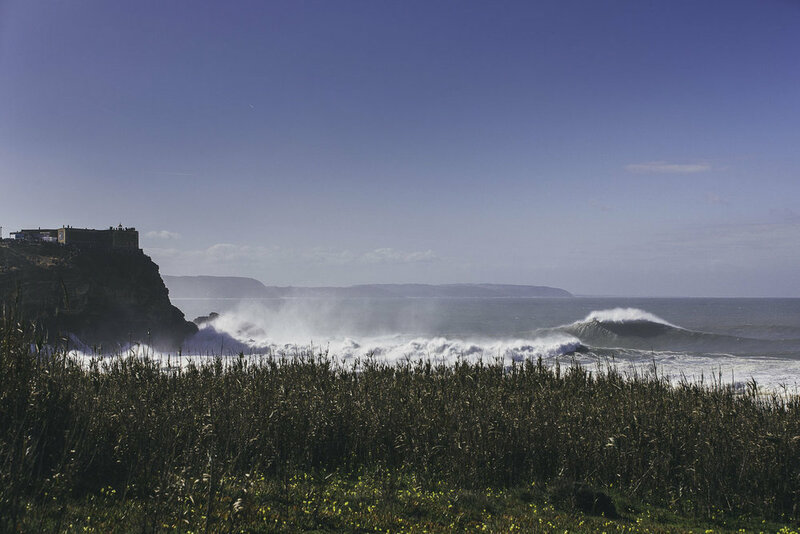 It only runs when the conditions are right and the waves are massive. Once the officials give it the green light surfers from around the world fly in and compete (similar to the Eddie Aikau competition in Hawaii that I wrote about in a previous blog). I was pondering this on my drive home and it occurred to me that I had all my camera gear with me, plus my passport and what better way to spend my weekend. So I booked a plane ticket to Lisbon and re-routed my satnav to Heathrow. A few hours later I was in Portugal. I booked a guesthouse online and hopped in a taxi to Nazare. After a late night welcome from a wonderful Portuguese family I went to bed and set my alarm for 5:30am. I woke up and walked out into the darkness. I could hear the sea roaring in the distance. I followed my ears and gradually started coming across other people, photographers, surfers, news crews gathering kit and making their way to the beach. 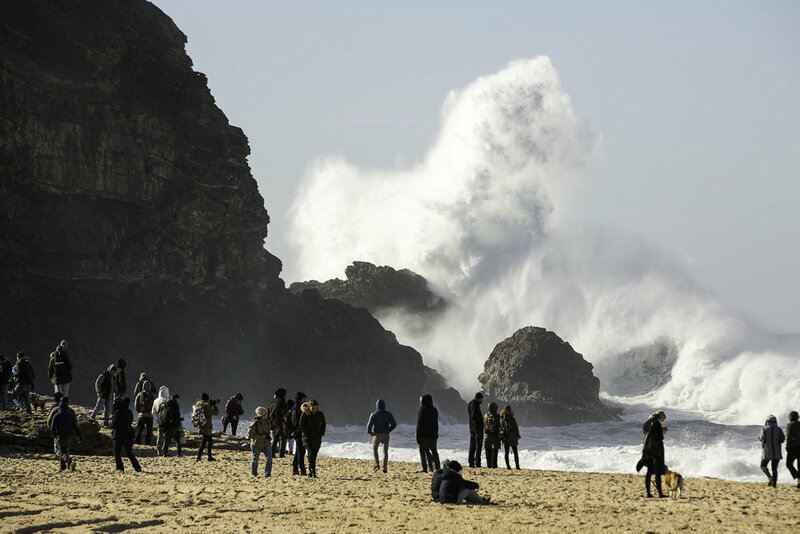 Early morning at Nazare. With only a couple of days warning people work through the night to get the event setup. Nazare is a fishing town about an hour and a half north of Lisbon. The main town sits at sea level but it has a huge hillside jutting out of the water to the north and this is what attracts the surfers. Deep channels in the seabed force incoming swells to stand up and with the right conditions create some of the biggest waves in the world. A jetski checking conditions at dawn. Hawaiian Billy Kemper making his way onto the beach for the first heat. As the sun came up the atmosphere built and before long hundreds of people had gathered along the headland to watch the event. By 8am the surfers were in the water. The surf built throughout the morning with some huge waves being caught. It is a massive operation with multiple jetski's keeping the surfer's safe and dragging them out of danger zones. Quads patrol the beaches, pulling skis out of the water and rescuing surfers when they are washed ashore. Drones fly overhead filming for the live broadcast around the world. There were some dramatic moments with boards being broken and competitors coming ashore with bleeding faces and broken ribs. 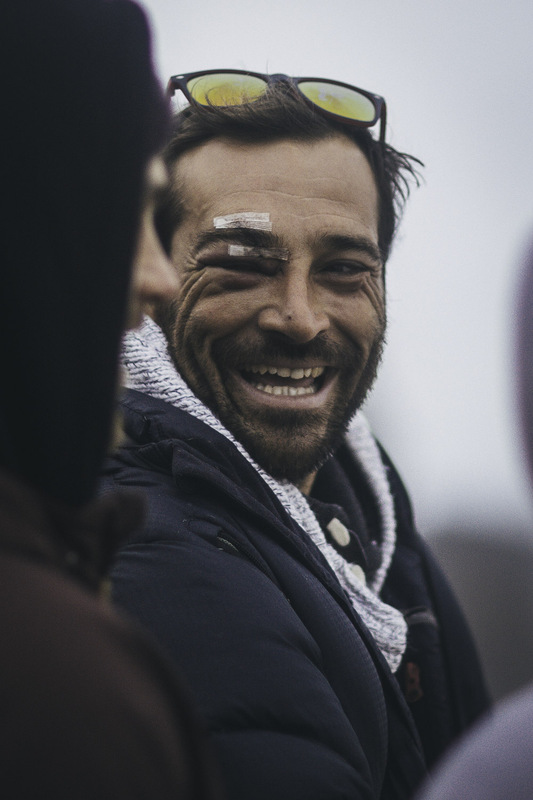 Local surfer Jaoa De Macedo was stitched up after a nasty fall. As the day went on the wind got too strong for the surfers to paddle into the waves and the competition was postponed until the next day. I spent the afternoon photographing the huge waves from various points on the headland. It also happened to be the weekend of Carnival so away from the surf the locals were partying. This made for some fun portraits when I wandered into town to buy food. The next day the waves were smaller and shrouded in fog which made photography difficult but the competition pressed on and in the late afternoon Brazilian Lucas 'Chumbo' Chianca came out of the water victorious. Finalists Lucas Chumbo Chianca, Billy Kemper, Natxo Gonzales, Kai Lenny, Grant Baker and Nathan Florence collecting their trophies. I watched him receive his trophy, walked back into town, filled my bag with Pastel de Nata and hopped in a cab back to the airport. I was home by midnight and ready for work on Monday morning. A spontaneous adventure and one of the best weekends I can remember. This Video is a good example of the dangers of surfing at Nazare (with Lucas Chumbo on the ski). After my photoshoot in Hawaii last year I have developed a bit of a love for Surf photography. I have had a few trips to the coast recently and have been pleased with the results. Perhaps an exhibition some time in the future??? Building my new website made me delve deep into a lot of my older hard drives and come across pictures I had not seen for a while. These pictures I felt, deserved an airing. This was a friends wedding but they asked me to take a few pictures. 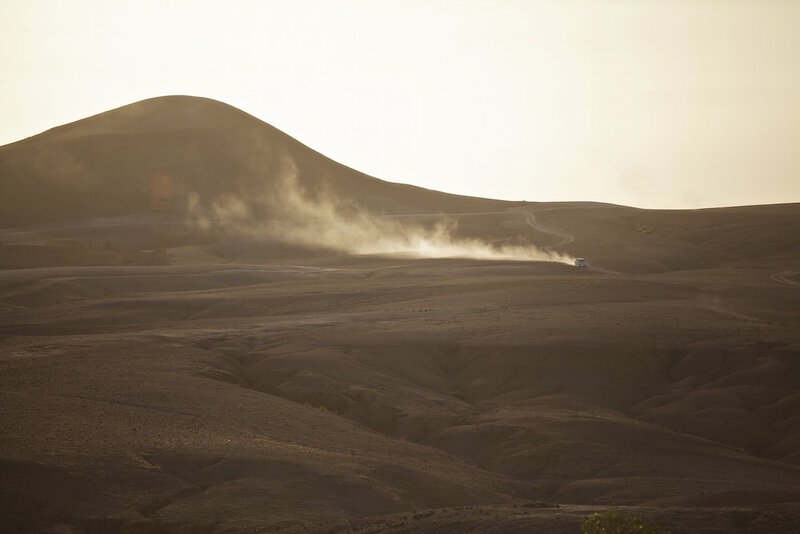 It was the most spectacular spot about an hour ourside of Marrakech. And possibly the best wedding dress ever. In August I had a great day photographing two very different subjects. In the morning I was booked to shoot a picnic at the beautiful Charlbury House in Oxfordshire. I didn't know what to expect but as with most of these types of jobs they are always a surprise. You will see from the pictures it was not your ordinary picnic. It also helped that it was a beautiful summer day and that the birthday girl was great fun to photograph. After leaving the picnic I headed off on a pesonal mission to go the 30th anniversary of the Bulldog Bash. The Bulldog Bash is the annual Hells Angels festival thats held at Longmarsden Airfield. I have never been before but each year I see strings of bikes passing through the Cotswolds and as a photographer I have always thought it must be worth a visit. I arrived on my own and unsure what I might find or how I might be greeted at the gate. But a very friendly (but rather intimidating) Hells Angel, congratulated me for coming alone, knocked £5 off my ticket for arriving late in the day and welcomed me in by pointing out I now had more beer money. It was getting dark and I wasnt sure how well appreciated my camera would be so I kept it in its bag most of the time. But now I know what to expect I hope to go back next year and see if I can get some better shots. On the 10th February 2013, 30 million Hindu devotees gathered at the confluence of the Ganges and Yamuna Rivers. They came to celebrate the Kumbh Mela, a pilgrimage of faith that takes place in Allahabad once every 12 years. It is believed to be the largest temporary gathering of human beings on the planet. Over the 2 months the festival ran it is estimated that between 80 and 100 million pilgrims passed through the vast makeshift camp. The pilgrims come for one purpose, to bathe at the point where the rivers meet, Sangam. This, they believe, will wash away their sins. Some have waited their whole lives for this moment, many travelling for thousands of miles. The festival is renowned as a gathering place for India’s devout Holy Men or Sadhu’s but for me the colour and character of the greatest show on earth came not from them but the overwhelming joy of the everyday pilgrims reaching their goal. These photos are a very small cross section of those people and their journey. 18 temporary bridges were built to allow the pilgrims to cross the rivers safely. Sometimes they were so overcrowded they had to be closed. On several occasions we had to walk for hours to find a bridge that would let us cross. One of the most amazing sights was to find this temporary community, making home under the vast bridge that spans the site. A proud mother we met living under the bridge with her family. Everyone was so happy to be at the festival that it made taking photos very easy. Often I would even be asked to take a families picture to capture the moment for them, even if they couldn't keep a copy themselves. One of the unexpected highlights of the trip were the boat journeys. From where we were camped it was easier to row across the river to the main bathing area than to walk up river to the nearest bridge. In order to get to the ghats for dawn we would set off on the boats in darkness, As we crossed the river towards the twinkle of the festival the sun would begin to rise and make for the most magical, peaceful moments. The festival attracts crowds from all over India and beyond but the majority of the pilgrims are elderly and often from poor, rural backgrounds. We saw many whole villages travelling together carrying nothing more than mats to sleep on and wood to cook on. They slept out on the open ground with just their saris or a blanket for cover. People getting lost is such a problem at the Kumbh Mela that there is a whole organisation set up to help reconnect people with their families. In a single day at the festival, 15,000 people were registered lost or missing. With the crowd being made up of many poor and elderly , mobile phones were not common, making the job very difficult. Dotted throughout the festival were 4000 loud speakers constantly blairing out what we thought was some sort of chanting. The noise never stops, continuing 24 hours a day. It was not until near the end of our time at the festival that we were told it was not chanting but the names of lost people being read out in an effort to reconnect them with their group. We saw whole families who had tied themselves together with scarves to stop them from getting split up while walking through the crowds. One of the surprising things we found at the festival was the lack of places to buy food. We had never considered that it might be a problem but when we arrived we realised that most of the people at the festival brought their food with them and cooked over open fires. On several occasions we saw huge groups suddenly congregate, seemingly without any organisation or direction, into huge lines, then out of nowhere huge vats of food would arrive and everyone would get fed. These flash mob dinners would form and disperse within 20 minutes, often feeding several hundred people. The picture above is of one of these gatherings. Crowds bathing on the 10th Feb. Looking back, it was one of the best things I have ever witnessed and I will be sure to make another pilgrimage in 2022. Earlier in the summer we swapped our house with an Icelandic family and spent a couple of weeks exploring the wonders of Iceland. The first 5 days we spent in the southern part of the Island and then the rest was spent exploring the remote Western Fjords, a truly beautiful area. It was near to the summer solstice so it never got dark. We covered alot of miles in our two weeks and it was more a holiday than a photography trip but here are a few favourites. I'll definetly go back and drive around the whole island at some point. Team photo during a midnight surf check. A remote beach near Breidavik. At the bottom is a small bothy with supplies for walkers or anyone who gets lost in the winter. Outside the hut was a dead whale. It had laid there frozen since the summer before, probably feeding the arctic foxes which live all around. This was taken at midnight on the drive home one night. I think it was the stillest water i have ever seen. Puffins on the Latrabjarg Cliffs. The largest sea bird cliff in Europe. Dynjandi Waterfall. Spot the tiny person. A Humpback whale that breached a little closer than expected. My favourite drive of the trip. Weaving around vast fjords on the road from Isafjordur to Heydalur. Posing with our trusty steed. While in Hawaii I shot a campaign for my wifes jewellery label Catherine Zoraida. We booked the beautiful beach babe Rocky Barnes for the shoot and spent the day taking photos at Kawela Bay on Oahu. These are some of the pictures. In February I spent a couple of weeks on the North Shore of Oahu, Hawaii. We rented a house at Rocky Point, a short walk down the beach from the infamous surf break Pipeline. The house was owned by the surfer Jeff Crawford and lucky for us, he lived right next door. Jeff was the first non Hawaiian to win surfings most prized trophy, the Pipemasters. In 1974 Jeff took the title from Gerry Lopez and since then has made Hawaii his home. He now spends most of his days hanging on his bench on the beach, telling stories. We couldnt have asked for a better host. We had planned for our trip to coincide with the Volcom Pipe Pro which is part for Surfing World Circuit. 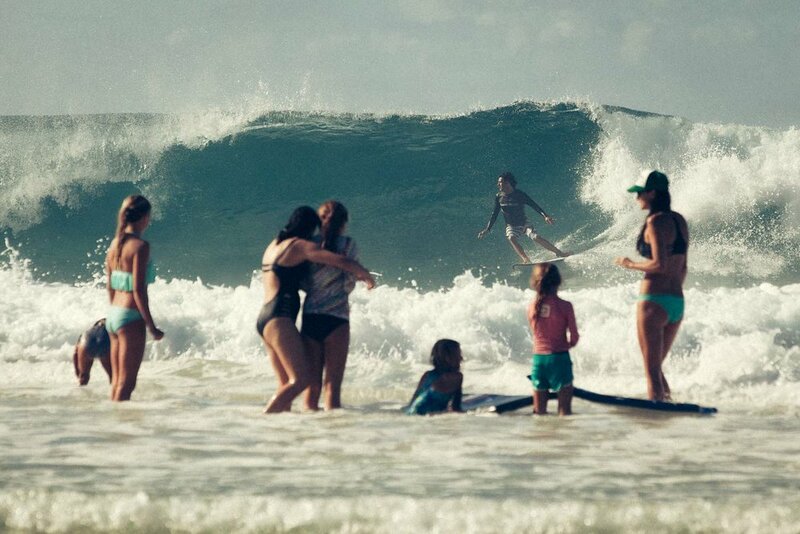 With huge El Nino swells pummeling Hawaii all winter we were not dissapointed. We watched a few days of incredible surfing before Kelly Slater finally took the title. We then flew to Kauai to trek along the rugged Nepali coast but two days into our time there, back on Oahu, they had called the Eddie Aikau competition. The Eddie Aikau is an invitational competition for only 28 of the worlds most legendary surfers. The competition is only held when the waves are deemed big enough and this was the first time in 7 years that they had called it. Once the judges give it the thumbs up, the surfers from all over the world have 24 hours to get to Hawaii. We hopped back on a plane, flew to Oahu, rented a car, drove to the north shore and parked up. There were thousands of people like us sleeping on the beaches and in their cars. After a sleepless night in our tiny car we walked 20 minutes along the road to Waimea Bay. As the sun rose over around 20,000 people (even the schools close when the Eddies on) the judges made their final call.... and cancelled it. The swell they had predicited had not arrived and with strict rules on how high the waves must be, they said it couldn't go ahead. It was a huge dissapointment. However, at this stage the worlds surfing legends had all arrived on the north shore and the waves were still enormous (just not the 50 foot they were hoping for) so as the day passed we saw some of the best big wave surfing for years. As the sun set over Waimea the beach was a huge party. After another night sleeping in the car we flew back to Kauai and continued our trip to the Nepali Coast and then on to Maui. 2 weeks after arriving back in the UK, Hawaii had another huge swell and the Eddie Aikau went ahead. John John Florence won it. It's worth watching the highlights here. The North Shore during big swells was an incredible thing to witness and I hope my pictures capture a small bit of it. The Volcom Pipe Pro at Pipeline, with Rocky Point beyond. Waimea Bay. The day the Eddie Aikau didn't run. Eddie Aikau crowds gathering around the bay. Waimea Bay from the bridge. Amazing Hawaiian kids playing in the huge shore breaks. Kelly Slater coming back in at Waimea. The plaque next to Pipeline with all the winners of the Pipemasters since 1971. Jeff Crawford 4th one in. We were also lucky enough to have a beer overlooking Waimea Bay with Tom Carroll. It was not until I saw this board that I realised he was 3 times Pipemaster. Sorry Tom.